There is a horse in this race that I have to bet. ADIRONDACK POSSE (#2) is getting a subtly positive trainer switch to Richard Metivier, who has actually done reasonably well with a limited number of starters on this circuit. This horse is also getting a needed drop in class out of some tougher New York-bred optional claiming races, and he has had his fair share of excuses. Two back he wasn’t able to close into a paceless race (note the fractions color-coded in blue) and last time he actually didn’t run that badly despite racing down inside behind horses for much of the stretch run. 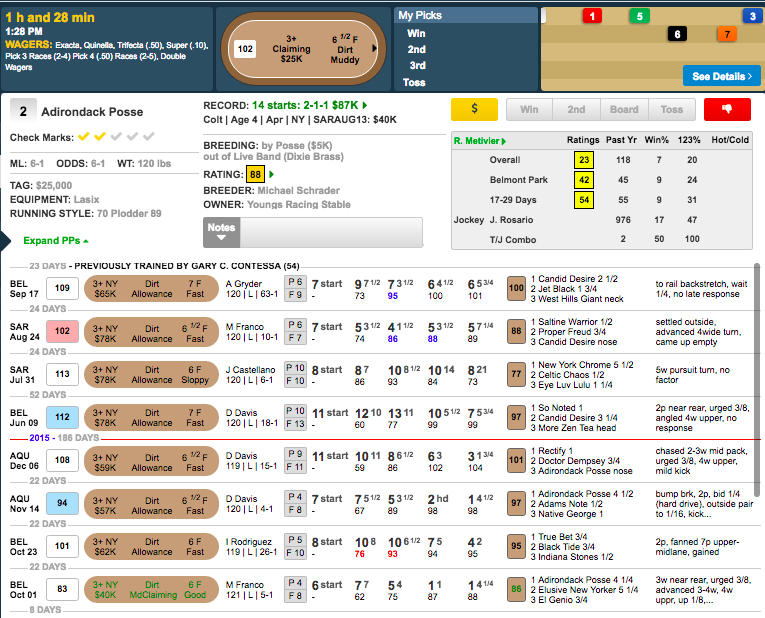 The track figures to be fast by the time this race is run, and, despite the modest pace scenario noted by our Pace Projector, I’m hoping he gets enough pace to close into with speeds like Pierce’s Prize, Baby Bear’s Soup, and Roman Revival in here. I’ll use my top selection with General Bellamy (#1), who blew the start last time and may be set for a much better performance in his second start for Jeremiah Englehart, Pierce’s Prize (#3), whom the Pace Projector is predicting to be the speed of the speed, and Two Weeks Off (#4), who seems to be heading in the wrong direction but does have back races that make him competitive.